The new Grand Avenue area at Disney’s Hollywood Studios is being re-imagined to capture the essence of modern-day Downtown Los Angeles, with vintage office buildings and warehouses representing various vibrant districts of the city. One notable addition is the BaseLine Tap House, a cheerful neighborhood pub specializing in beer and wines from California – it’s slated to open this fall. The pub will pay homage to the building’s former life as the Figueroa Printing Company. The space will have cool architectural and mechanical details with exposed walls and old printing equipment and artifacts, blending the past and the present. It will also have a very welcome tree-shaded terrace. 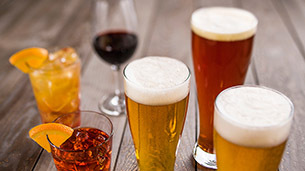 California craft ales, lagers and cider are the mainstays of the drink menu. California wines on tap along with specialty cocktails are also offered, with gourmet non-alcoholic lemonade and soda to round out the drink selection. If you’re in need of a nibble, try one of the small plates, including a Bavarian pretzel with mustard and beer-cheese fondue, spiced almonds or a charcuterie board featuring California cheeses.